So what does it take to be a die-hard Weber fan? 300 miles, 7 Weber grills, and a dog named Robby. Meet Lee Barnes, a competitive griller and enthusiast from Corpus Christi, Texas with a passion for all things charred, crispy, and juicy. 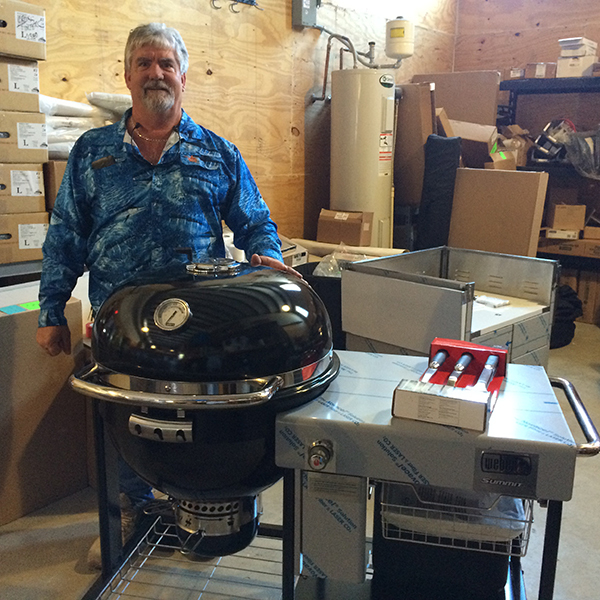 On April 14th of 2016, Lee drove 3 hours and more than 300 miles round-trip from Corpus Christi to San Antonio in anticipation to purchase our newly released Summit Charcoal Grilling Center. As a long-time Weber fan, it was worth the drive. Lee’s new Summit Charcoal Grilling Center joined his impressive collection of six other Weber models: a 14” Smokey Joe Gold, 14” Smokey Joe Silver, 18” Smokey Joe Platinum, two Performers, and a Ranch Kettle – all in pristine condition! Lee has been an avid griller since he was a child and has become known for his grilling abilities on a competitive level. Is your mouth watering yet? Learn more about the #grillofalifetime and its endless possibilities here! Have your own Summit Charcoal Grill? Tell us about your ultimate smoking experience. Lee is currently Senior Director of Construction Projects at Global Blue Technologies, an aquaculture company based in Japan. He was previously a veteran Naval Aviator and studied Electrical and Electronics Engineering at U.S. Navy Schools and the University of Tennessee. With his new Summit Charcoal Grilling Center, I’d say we got a new grilling master! Thanks for being a Weber fan Lee!